We can't just say “we love animals” while we eat, wear and use products containing remnants of their tortured and mutilated bodies. We have to expand our respect for others to include anyone; any being with feelings and consciousness...The many benefits of plant-powered living are too vast to ignore. Veganism is a solution for what ails our planet; violence and war, dwindling resources and expanding human population, lack of health and vitality, and a ‘clouded way of thinking’. 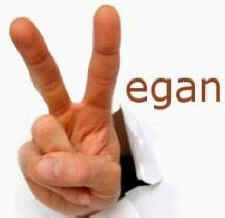 If any two words were synonymous with veganism – it would be ‘animal rights’. Since its inception in 1944, veganism has been a position of non-participation in animal exploitation. With the word ‘vegan’ becoming more popular, the meaning has become weakened, or the benefits to humans are touted more than the original intent of animal rights. ALL animals – whether human or other species – by virtue of being feeling and conscious – possess the birth right not to be bought and sold as a commodity, owned like a slave, oppressed, exploited, or attacked by humans. Animals have the inherent right not to be forcibly impregnated, have their newborn who they painfully just gave birth to - kidnapped and then killed – all socially accepted “normal” practices of the dairy industry. What society accepts as normal is in fact not normal – customary, but it’s not normal behavior to separate a newborn from his or her mother so people can drink the milk of another species; milk which is meant to grow an 80 pound calf into a 1,000 pound cow in less than a year. How normal would it appear to see a human suckling on a cow's udders? An animal farmer selling cows online described my vegan views (that we don’t have a right to buy and sell a cow) as strange. I have a very different way of defining strange. Eating corpses is strange. Being entertained by animals who were forced to endure painful misery, humiliation, and captivity - horse and dog racing, animal fights, circuses, rodeos, animal acts, seaquariums, zoos – now that’s strange. What is socially accepted and passes for normal is actually cruel and callous. We need to raise the ‘normal bar'. Because humans are in fact animals, we are able to have empathy for fellow animals; who have many similar features. And when we empathize, we can clearly see that animals feel. They leap in joy. They speak - but like someone from another country, they speak a different language. If we tune into them and want to hear what they are saying – we can communicate and see that they feel much like we do - they want to live their lives naturally and free from harm, and protect and nurture their offspring. When we empathize, we see that animals have two eyes, a face, and a brain. They have a nervous, reproductive, digestive, circulatory, and respiratory system. They have pain receptors; and therefore feel pain as we do. Animals feel; that’s essentially what it means to be an animal. We have known friendship with dogs and cats, but those of us who have rescued animals of various other species – are certain that these animals are more ‘family’ than ‘food’. They're more friends than enemies to dominate, wear their skins, hunt and hang their heads on walls as trophies. Farming, imprisoning, and anally electrocuting fur-wearing animals so we can adorn ourselves in their skins, as well as any number of business-as-usual practices presently considered 'normal' by society – are, in reality - savage. We can all do better. Each of us can do our part in uplifting the collective consciousness of humankind. What role could be more important for us to play in this feature film called Life? We can be forerunners, pioneers of a new world; a non-violent one…it’s what “everybody” has been wishing for ~ Peace on Earth…Goodwill to All… But to actually bring about Peace on Earth, we necessarily have to live the ideals of veganism. We can't just say “we love animals” while we eat, wear and use products containing remnants of their tortured and mutilated bodies. We have to expand our respect for others to include anyone; any being with feelings and consciousness. Long-term vegans have established a way to live without directly demanding animal exploitation. For 35 years, my cosmetics and toiletries, food, clothing, and products have been free of animal ingredients nor were they tested on animals. Despicably testing products in the eyes of bunnies, forcing beagles to inhale cigarette smoke, vivisection on cats and pigs, holding primates captive and forcing them to learn what humans want them to learn, medicines tested on rats and mice and whoever else, dissecting frogs in schools – ‘animal experimentation’ is just too similar to the Tuskegee syphilis experiment; where African-American men were unknowing and did not consent to being “guinea pigs” in a lethal-to-them experiment. When humanity adopts veganism, there won't be derogatory or speciesist words that are an abomination to the English language. For example: “guinea pigs” or “livestock” – “the butcher” – “slaughterhouse” – “leg of lamb” – “kill two birds with one stone” – “you rat, you dog, you animal”; as if being an animal is bad or lowly. It is a mistaken belief that animals are higher or lower – they are other species of animals, fellow Earthlings. What is considered normal - is not normal. Humans have been bullies, captors, slave-masters. In Truth (with a capital T), what is really normal is the vegan concept; the perspective where every animal has the right not to be exploited or violently assaulted by humans. We can be protectors, defenders, friends to animals, rescuers - however, at the very least, people have a duty to not harm beings that are unquestionably sentient. Humans must return to the animals what is rightfully theirs. Animal rights advocates are not asking for “better treatment” or “better welfare conditions” within a system that is completely unethical. Would we ask for bigger beds in the Holocaust’s concentration camps - or - would we work to wipe out the concentration camps? We are advocating for fundamental rights of anyone sentient. We are shining a light of Truth on indefensible habits, social custom, traditions that have been accepted as the “norm”. Most significantly, we are misguiding the next generation that violence is normal behavior. You and I were indoctrinated since day one by society - that humans are ‘top of the food chain’, the crown of all creation, that God gave us the right to kill and eat animals, or that some animals are “pets” while others are to be ill-treated, and other falsehoods that molded all of us. The time has come for us to break the cycle and stop filling the precious innocent minds of children with the lies we were taught; lies like humans can abuse animals. Teach the next generation to respect feeling, breathing, living, and perceptually-aware animals, regardless of species. We may like to be close to a dog, while not a fish, some animals might be adorable while some look alarming – but they all deserve, at least, not to be harmed (by humans). We are reaching a point in human evolution where we are undeniably able to thrive without consuming anything animal-derived. Many plant-powered athletes, for example, the world champion extreme marathoner and vegan: Fiona Oakes and other vegan athletes - are living proof that we can more than thrive on a vegan diet. The reason we can legally own, enslave, buy and sell, and murder animals – is because of the almighty ‘money god’ that humans truly worship over their other deities. The profit motive supersedes what is right. However, ethics and social justice must trump immoral ways of attaining money. Slave masters were driven by their personal monetary gain only, which is comparable to animal harmers (oops farmers). Abolitionists proclaimed that money and profit are irrelevant when it comes to the objectionable behavior of owning a human being. It still holds true. We need to build a new world that is not built upon enslaving anyone sentient. Animals are individuals that should have basic rights, equally under the law, not to be a slave to a human, not to be “a someone” who is perceived and treated as “a something”, not to be a he or a she who is seen and referred to as an “it”. This objectification of other animals is to make people feel okay about their abnormal violent exploitation of others; that is socially accepted but is nonetheless wrong – even if the majority doesn't yet see it. Be vegan for ‘what is right’ - including every individual animal's right. The vegan ideal is open to all; rich or poor, atheist or theist, young or old, any shade of skin, any nationality or ethnicity; any gender identity, anybody - everybody. Help educate others that what is presently accepted as normal; is unacceptable. Veganism has far reaching ramifications for a saner, cleaner, less violent world. Veganism is a protest to “the way it is”. Veganism is a Great Truth whose time has come. Veganism is the antidote to a world ravaged with violence. It’s a solution to our planetary problems. Veganism is our next step. With humanity's acceptance of vegan living, we are making history; bringing about a world where veganism is the new normal.